I used to watch Sesame Street everyday after school. Eventually, I realized that it really wasn’t helping me with my college courses. I have done this, but it only served to remind myself how glad I am that I’m an adult and not a kid any more. Kids don’t get to do such fun things like go to a job every day, balance checkbooks, pay bills, pay taxes, pay for ice cream, maintain a home, flush spiders, watch their diet, watch their friends make bad choices, watch their bodies basically fall apart on them if they don’t exercise every now and then, use toilet plungers for their original purpose, experience a mid-life crisis, experience pain just from walking, despair at the state of the world, or drive responsibly. 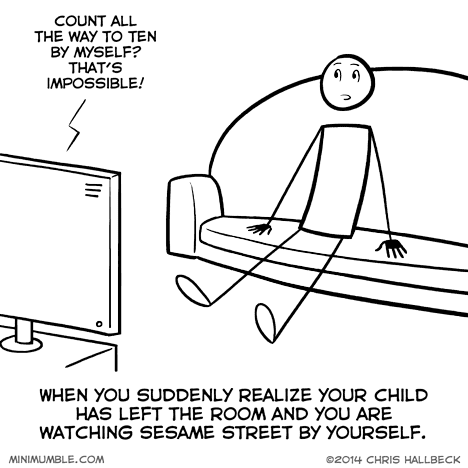 You realize that you’re watching Sesame Street by your self when your friends come in and make strange snickering noises. I’m glad I’m old enough to remember the show in the good ‘ole days from the eighties. I was born in 1969, so I remember when Snuffy was still thought to be Big Bird’s imaginary friend, Mr. Hooper was alive, SAM the robot, and no Elmo. I remember all of that, but Mr. Hooper is one of my vaguest memories.